1305663918 -Through ongoing research into students’ workflows and preferences, ORGB 5 from 4LTR Press combines an easy-reference, paperback textbook with Chapter Review Cards, and an innovative online experience – all at an affordable price. New for this edition, students explore ORGB 5 anywhere, anytime, and on most devices with ORGB Online! With the intuitive StudyBits™ functionality, students study more effectively and can visually monitor their own progress. 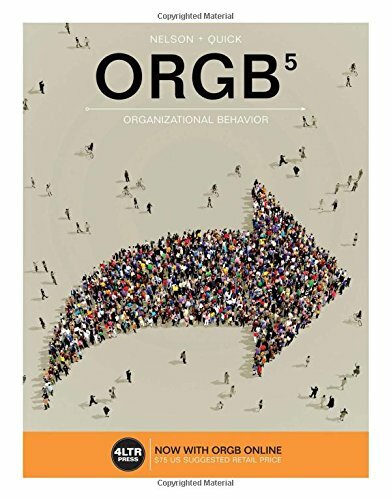 Coupled with straightforward course management, assessment, and analytics for instructors, ORGB 5 with ORGB Online engages students of all generations and learning styles, and integrates seamlessly into your Organizational Behavior course. ORGB 5 features include updated quizzing and testing content and the addition of interactive problems into the Online narrative flow. In addition, students will have the ability to use StudyBits to customize their own learning experience and flashcards.